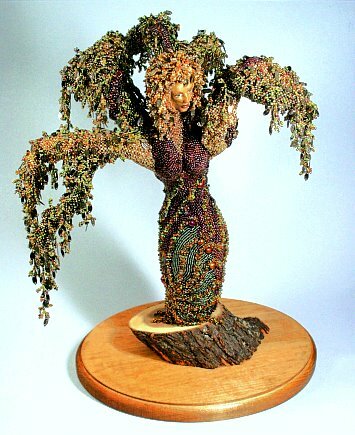 Artists around the nation were asked to create a Beaded Art Doll by manipulating beads and forms into an imaginative tactile and visual 3-dimensional representation of this year’s theme:Earthen Mother . “The mirror reflects more than my hands can feel. Lines, edges, shadings, a weariness under the eyes, an awkward stance. a compassion and wisdom and wonder so many people rely on. capture the fullness of me as I age in place . 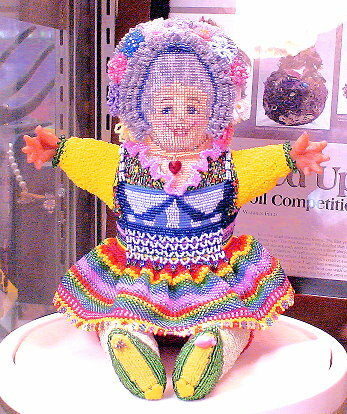 The Fourth Bi-Annual 2009 ALL DOLLED UP: BEADED ART DOLL COMPETITION is offering a first prize of a $1000.00 shopping spree on the Land of Odds web-site (www.landofodds.com), and a Runner-Up prize of a $400.00 shopping spree on the web-site. You can read our DESIGNERS GAZETTE, Fall, 2009 online. 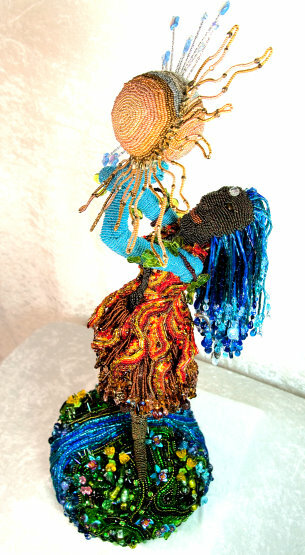 Creating a Beaded Art Doll requires an extraordinary mix of multi-media talents by the successful artist. It involves the design of a 3-dimensional doll form. 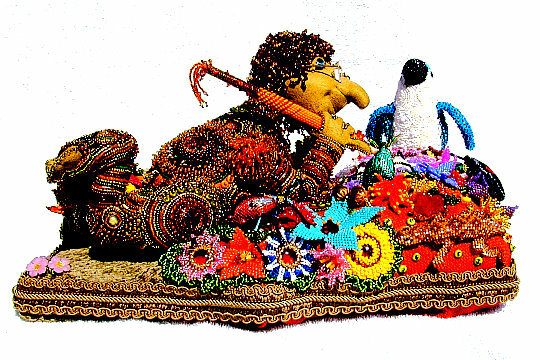 It requires an imaginative application and manipulation of beads resulting in a tactile, visual and emotional representation of the artist’s goals. This year, these goals are focused on the theme: EARTHEN MOTHER. The Fourth Bi-Annual 2009 All Dolled Up: Beaded Art Doll Competition — sponsored by Land of Odds, Be Dazzled Beads, The Open Window Gallery and The Center for Beadwork & Jewelry Arts in Nashville, TN — sought out beaded art doll artists nationwide. This competition primarily focuses on the design skills of the doll artists; it’s not merely a beauty pageant. Six semi-finalists were chosen by a panel of experts from The Center for Beadwork & Jewelry Arts from 12 wonderful entries. Images and stories will be displayed online around November 7th on the Land of Odds website (www.landofodds.com ). Visitors will be asked to vote and evaluate each doll, to help select the Winner and Runner-up. The winner receives a $1,000 shopping spree on the website; the Runner-up receives a $400 shopping spree). “As a child you spoke to me from mud as I sat at the far end of the garden patting earthen cakes between my palms. And how luminous that mud like the color of your skin could be. Chocolate, gold and olive green the fertile soil in which you breathe. Life survives and thrives in your rich ground…. “I shall tell my story through TA DAH or TA for short. TA had been to the beauty shop for a new perm and the latest gossip. Her curls turned out to be a bit much and she stepped on bubble gum on her way to the car. What a day! Upon arriving home, TA looked in the bathroom mirror at her new do and the mirror changed her life and mine forever…. “You embody changes I want to make, so I aptly name you Aikaterine, meaning each of the two…. …But Aikatrine has no time for self-reflection. You were not always as you appear this day. You were fearful and lonely. You turned to learning for a safe haven, a place for you to be acknowledged in a positive light. Then sprang the hunger to be taught, a desire that was placed within the seed from which you sprang. Your roots began to thrive in the fertile soil that had been plowed by your ancestors’ faith. They grew deeper and had tapped into the eternal spring of the Spirit and from it came an understanding…. Then I am awake lying in my own bed….I touch the place where the dream woman had kissed me, and can still feel the moisture from her breath. I know this woman. I’ve seen her before….The woman was Rachel Carson the author of Silent Sprint, and I had followed her into her dream…. 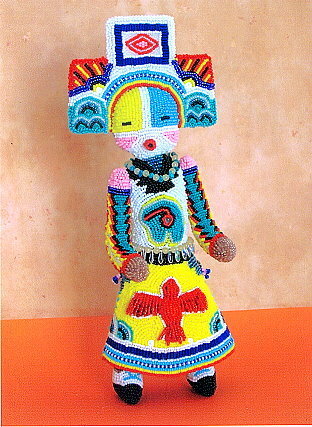 The Artist is given wide leeway in techniques for how the doll is to be beaded, and may use one particular technique or several. 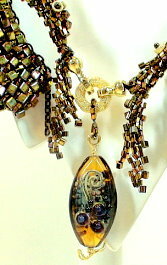 Techniques, for example, may include bead weaving stitches, bead embellishment, bead appliqué, bead knitting, bead crochet, bead embroidery, lampworking. For the 80% of the surface area that must be beaded, these would NOT include the application of rhinestones, sequins, nailheads or studs. The beads may be of any size, shape, color and material. The Artist may interpret and apply the theme any way she or he chooses. 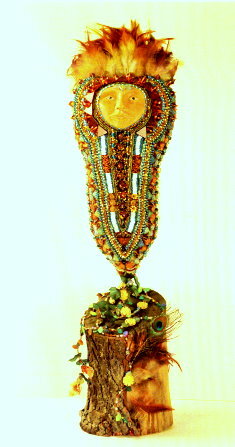 The Beaded Art Doll might be thought of as a plaything; or as a visual representation of a person, feeling, spirit or thing; or as a tool for teaching; or as a method for stimulating emotional development or healing.